An inspection report by the CAG has raised several questions over the functioning of Rajya Sabha TV, even as advocate Prashant Bhushan moved the Supreme Court over irregularities in the appointment of senior people in the Rajya Sabha secretariat including its channel. The court of chief justice H L Dattu asked Bhushan to approach the Delhi high court, adding that in case it refuses to entertain his plea, he could approach the apex court again. Bhushan alleged large-scale irregularities in the appointment of senior officers of the rank of joint secretary and above in the Rajya Sabha secretariat including the CEO of RSTV. The CAG inspection report says the channel doesn’t have a roadmap, while questioning the very relevance of a separate channel for the Upper House of Parliament. The channel has spent over Rs 1,700 crore since it was started in 2011. The channel came into being in 2011, but became fully functional only in May 2012. The audit has said that until February 2012, even before the channel became fully functional, the executive directors and executive editors had spent Rs 60 lakh on travel. 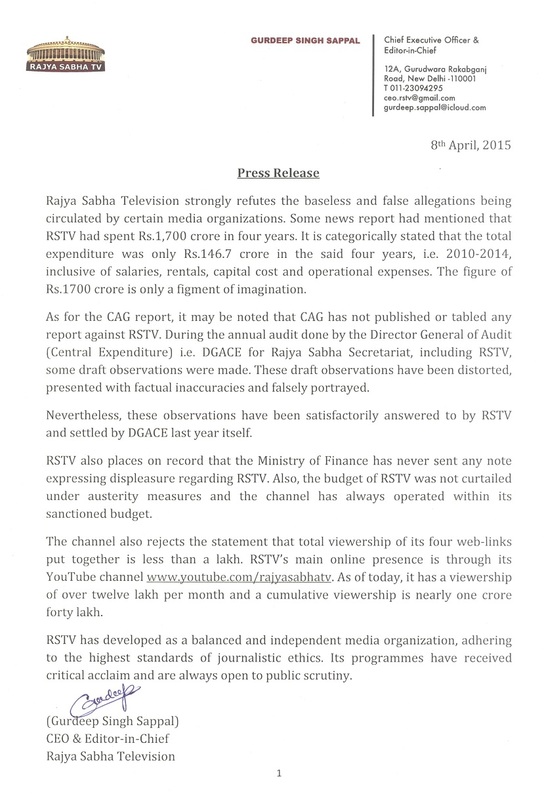 Since it started operations RSTV has had no revenue, and has carried out recruitments that do not adhere to laid down norms, the inspection report says. Among other things, RSTV also does not track its viewership, it found. It has also raised questions about the way RSTV has made senior-level appointments and fixed their salary structures, which are not in conformity with that of Rajya Sabha secretariat or government. The inspection report has also pointed that RSTV management has taken several ad hoc decisions.